Loss of lumbar lordosis correlates well with the incidence of chronic low back pain in adulthood [1, 2]. Sedentary lifestyle contributes to loss of lumbar lordosis as well as scoliosis and thoracolumbar or lumbar kyphosis. Therefore this condition should be addressed by physiotherapy and braces, which improve the sagittal mal-alignment and essentially re-establish lumbar lordosis. The success rate of such a treatment in general does not appear to be high and compliance is generally described as moderate or poor [3–5], however a significant pain reduction has not been reported upon in the literature [5, 6]. The treatment with the "sagittal re-alignment brace"  (physio-logic™ brace; EP 1 604 624 A1) has shown to improve chronic low back pain in a short test period . As the brace impairs patterns of movement leading to a lumbar kyphosis, sitting activities require re-education, such as car driving with the brace. For these reasons the brace has been less favourable with the patient; however all of the patients appreciated the benefits of the immediate reduction in pain whilst in the brace. Thus a prospective study was carried out to estimate also mid-term effects of the treatment with the physio-logic™ brace. The latest standard of this sagittal re-alignment brace was developed in summer 2006 from a prototype, first adjusted to an adult scoliosis patient with pain in 2004 . Since then it has been applied in mature adolescents with scoliosis as the final brace applied before weaning; in a few patients at risk for progression where the application of a Chêneau brace has not been possible and for the treatment of chronic low back pain in scoliosis patients . 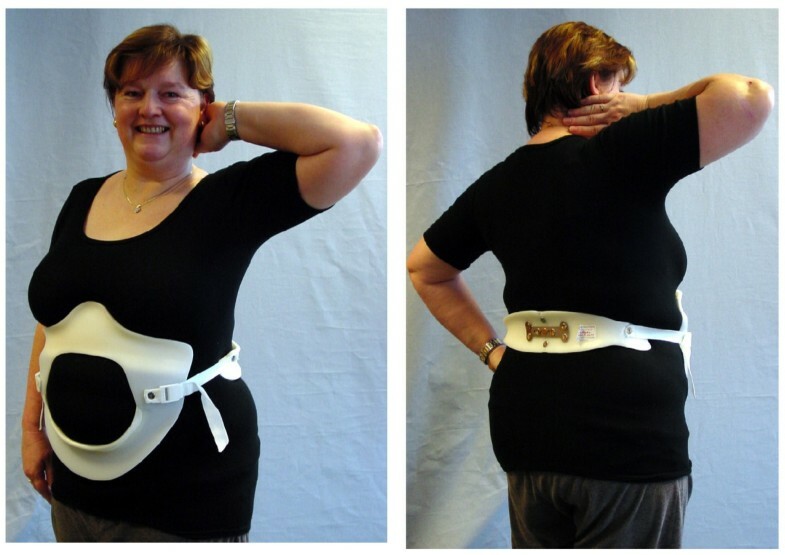 In a preliminary report, involving scoliosis patients reporting pain, the physio-logic™ brace has proven to be effective at reducing their pain intensity, whilst the patients remained in the brace. The results seem superior, when compared to other brace types, usually applied for pain treatment as reported in international literature . The first mid-term results with patients followed up for a minimum of 6 months , were disappointingly unsuccessful. In this first follow-up study , 29 Patients (females only) with an average Cobb angle of 37° (SD 22) and an average age of 41 years (SD 21) were treated with the physio-logic™ brace for an average of 7.5 Months (SD 5,6). The amount of allocated in-brace time as well as total in-brace time daily remained the individual patients' choice, however all patients agreed to wear the brace for a minimum of 8 hrs per day. Pain intensity was high (3,38) before treatment (scale 0–5) and low (1,28) after adjustment. The differences where highly significant in the Wilcoxon test (z = -4,29; p < 0,0001). After a follow-up of a minimum 6 months, the pain intensity was moderate to severe (2,69). The difference to the pre-treatment value was of no greater significance. Although the brace seems to work in the short-term, the mid-term results according to the cited preliminary report  did not justify a prescription. Compliance in the preliminary follow-up study  was poor, as in other studies about brace treatment in patients with low back pain [3–5]. The reasons for this may or may not relate to the individual patients' choice over brace wearing times. The purpose of this study was to investigate as to whether a change in the approach to the patients' education would improve the compliance in order to allow better treatment results in the mid-term. In the latter case a prescription of this brace would be justified in order to attempt to prevent surgery. 67 patients (58 females and 9 males) with chronic low back pain (> 24 months) and the diagnosis scoliosis (n = 56; average scoliosis angle 41° ranging from 10 to 91°) or kyphosis (n = 11) were treated with a sagittal re-alignment brace (physio-logic brace™) between January 2006 and July 2007. The distribution of diagnoses can be seen in figure 1. The indication for this kind of brace treatment was derived from a positive sagittal re-alignment test (SRT, see ) and from the exclusion of any successful conservative treatment within the last 24 months. The main aim of this intervention was to measure reductions in pain and to avoid surgery for chronic low back pain. Distribution of the diagnoses in the sample of patients. There were patients with scoliosis and kyphosis in the sample described. 41 had an Adolescent Idiopathic Scoliosis (AIS), 4 had a Juvenile Idiopathic Scoliosis (Early onset scoliosis = EOS), 3 had an Infantile Idiopathic Scoliosis (EOS), 2 had congenital scoliosis (CS), 3 had scoliosis in combination with other diseases, 3 had degenerative (de novo) scoliosis (DS) and 11 patients had kyphosis (Ky). Before brace prescription the brace action was simulated and pain reduction was tested . Brace treatment was prescribed only when a significant reduction of pain intensity registered whilst performing the SRT  prior to bracing (Pain reduction of at least 2 steps on the VRS). Pain intensity was recorded before brace treatment (t1), within the 1st week after brace adjustment (t2) and at follow-up, at average 18 months after brace adjustment (t3) using the Roland and Morris VRS . Foam model of the physio-logic™ brace. After the anthropometrical data (circumferential and longitudinal trunk measurements) are recorded, the foam model is milled from a blank hard foam block. 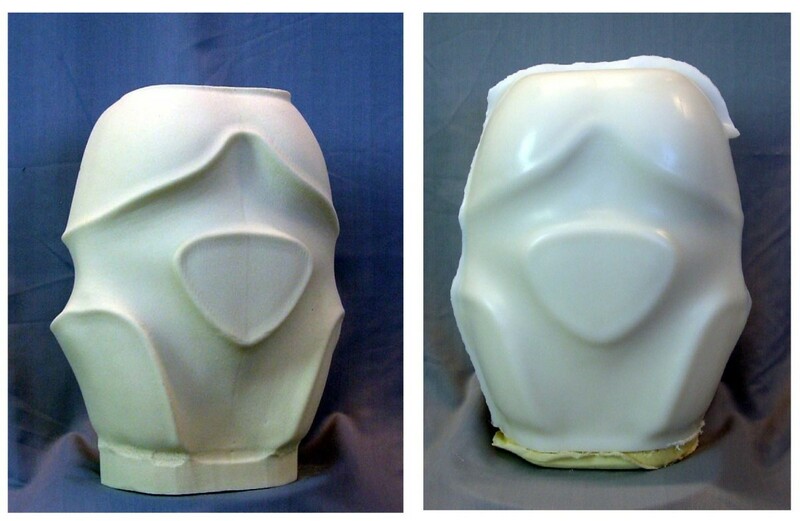 This hard foam model is wrapped in a heated PE-plate, which is vacuumed to the models surface. The brace parts are cut from the PE-model and adjusted to the patient. The physio-logic™ brace is manufactured by Orthomed OT Services, Bad Sobernheim, Germany. After the anthropometrical data (circumferential and longitudinal trunk measurements) are registered, the foam model is milled from a blank hard foam block. This hard foam model is wrapped in a heated PE-plate, which is vacuumed to the models surface. The brace parts are cut from the PE-model and adjusted to the patient [7–9] (Figure 3.). The Roland and Morris questionnaire used for this study is a verbal rating scale (VRS) providing certain steps of subjective pain judgements recorded by the patients themselves . It contains five rating steps from "low pain (1)" to "the pain is hardly to bear (5)"
While the bracing standard was not largely changed in comparison to the preliminary series , the patients in this study were obligated to wear the brace for a minimum of 20 hours per day at least for the first 6 months of treatment. After this period, brace wearing times were set by the individual patient, depending on the residual pain intensity. Comparison of the pain intensity as estimated with the help of the Wilcoxon test at t1 (before treatment)/t2 (at brace adjustment) and at t1 (before treatment)/t3 (after an average follow-up time of 18 months). Statistical data for the group of 21 patients, who stopped bracing at 6 months of treatment. Comparison of the pain intensity as estimated with the help of the Wilcoxon test at t1 (before treatment)/t2 (at brace adjustment) and at t1 (before treatment)/t3 (after an average follow-up time of 18 months). No significant differences t1/t2, but significant differences in the mid-term (t1/t3). The role of the sagittal profile in the development of a lumbar scoliosis is not yet clear . Correction of the lumbar sagittal profile in a sagittal re-alignment brace leads to an improvement of 3D correction and can in short-term, be compared to the correction effect of other larger braces aiming at a 3D correction . It is necessary to recognise that the severity of symptoms in patients with back pain, as they increase in a linear fashion with progressive sagittal imbalance [1, 2]. The results of these studies also show that hyperkyphosis is more favourable in the upper thoracic region but very poorly tolerated in the lumbar spine [1, 2]. This is why the physio-logic™ brace may be regarded as the 'gold standard' for bracing of patients with pain in combination with a reduced lumbar lordosis, as the physiological sagittal profile is improved or even restored when this specific brace is applied. In the mid-term a significant pain reduction is possible in chronic postural low back pain  using a sagittal re-alignment brace inducing lumbar re-lordosation, in a population whom otherwise may have chosen surgery. In a preliminary report at adjustment (t2) highly significant improvements of pain intensity have been shown, however at 6 months of treatment no significant improvement was retained . The brace should not be used in patients with chronic low back pain due to lumbo-sacral instability (e.g. spondylolisthesis), even if the SRT measured a pain reduction . As with some cases a secondary increase in pain intensity is possible. To exclude the condition of a spondylolisthesis before brace application, X-rays of the lumbar spine to view the lumbo-sacral junction from the side are necessary. The beneficial effects of this brace in patients with lumbar scoliosis and the symptoms of spinal claudication has also been demonstrated ; therefore lateral listhesis and spinal claudication should not be regarded as being contraindicated for this treatment. In contrary, when there is evidence that sagittal re-alignment leads to a correction of scoliosis [8, 12, 15], we may assume that this brace restores stability of the lumbar spine by locking the lumbar facet joints. 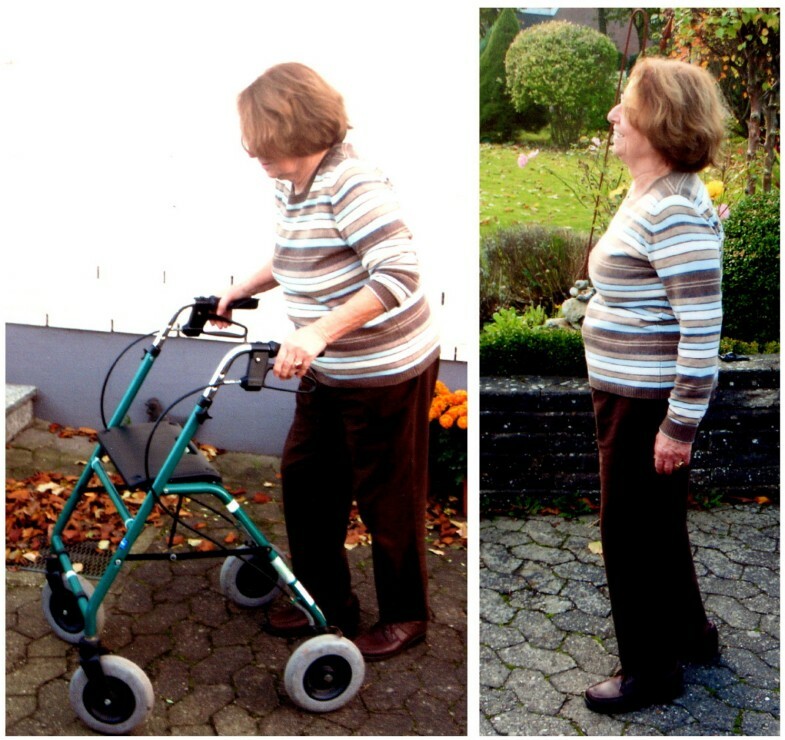 As has been shown in several patients within this study, the restoration of function activity such as upright walking without the need of additional aids has been accomplished (Figure 4. ).